Some iOS users have reported problems activating iMessage and FaceTime on their freshly updated iPhone, iPad, and iPod touch devices. Some of the initial activation errors were probably due to immense simultaneous demand being placed on Apple servers, but since some people are still experiencing this problem after the initial iOS update release rush, we think it’s worth addressing with a few solutions to remedy the issue. That is exactly the kind of error message we’re looking to resolve here, so follow the steps in order and you should be able to get your services functioning again in short order. If that stuff looks good, try toggling the services off and on again. Still getting the Activation error? Try resetting your network settings next. If you have a passcode set you will need to enter it before resetting. When finished, join your primary wi-fi network again and check messages and/or FaceTime to see if it’s working. Send an iMessage to someone who also uses iMessage and it should go through. This is a tried and true trick that has worked since iMessage was first introduced. For FaceTime, you may want to attempt to initiate an audio call before a video call. Audio calls are lower bandwidth than video and we’ve seen a few reports of this causing both to work. Turn the iPhone or iPad on and off again. All you need to do is hold down the Power button, slide to power off, then power it back on. Once you’re booted up again, try sending an iMessage or initiating a FaceTime call, everything should be working as expected. In particularly stubborn situations you may need to restore iOS from a backup. You can also try resetting the device to defaults, setting it up as new, activate iMessage and FaceTime through your Apple ID, then restore from a backup once you have confirmed it works – we have received an email from a user stating that particular sequence to be effective when everything else didn’t work. Restoring takes a little while, but so long as you back up first it’s not too bad, and if you go through official channels an contact AppleCare about continuous iMessage activation issues they will probably recommend you restore from a backup after performing a variety of other tricks. Finally, you may find that using a new Apple ID also resolves some of the issues, but considering how much stuff is tied to an Apple ID this is really not recommended. For most people, updating to iOS 7 has been trouble free, but now that we’ve fixed your iMessage and FaceTime errors, you can go about addressing battery life issues with iOS 7 and resolving any speed problems. If you are experiencing a persistent problem with iOS 7, let us know on Twitter, Facebook, email, or Google+, and we just may be able to resolve it. Hello all, unafortunately we have all had the same issue. Before doing anything else, go ahead and ser your Clock & Time under sections Settings>General>Date & Time Tab. There you will need to Turn ON the Set Automatically button. If you have Reset your Network a few times, go ahead and try now to toggle OFF your Facetime and turn in back ON. You must have te iMessage tab toggle OFF before turning the Facetime button ON. And again, you must syncronize the Date & Time first to your present time. Thanks to all, let others know if this works for you. 1.- backup the iPhone in iTunes. 2.- Restore the iPhone to factory settings. When finish, unplug the iPhone from your Mac, thus, iTunes will not ask you to restore from backup. 3.- Configure the iPhone as new, with the same Apple ID, Activate iMessage and FaceTime, after few minutes the Mac will ask for access using your Apple ID password. 4.- After check that those are correctly activated, restore the iPhone from iTunes backup. 5.- If after restoring you see again the “unsuccessful activation ” message for iMessage and FaceTime, deactivate and activate them again, after few minutes you’ll see that those are activated. I hope this can help. 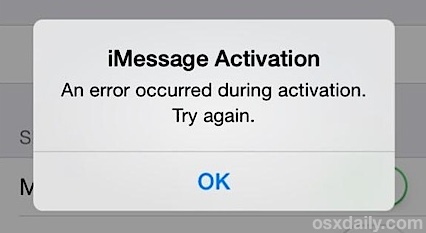 have my iphone 5s same problem.But don’t work again imessage and facetime.I made all proccess,which you say that. Everyone keeps talking about toggling this on and that off, lol. The problem is that I get the message when trying to log into imessage or facetime, there is no button to toggle because Im not logged in when I go to settings! I had never had to log into anything but one day I turned on the tablet and it promped me to log in. I couldnt log in and had to reset my password. That worked for a day and then it happened again, I reset it again and it worked for a day or two, then AGAIN!! I cant remember if I reset it again. I remember having a LOT of emails from apple like I was trying to reset but I know I hadnt tried again, just got fed up and didnt bother with messaging any more. Today I wanted to try again, so reset my password. That went smoothly but cant log into the services! You would think it would be seamless and auto it all together. Anyway Ive tried everything but the backup and restore. Last time I tried to install the software on my pc it had errors so thats off the table, and really its not an issue with my tablet. Sigh. - iPhone Shows Photos in Storage, But None on Device? Here’s Why!